Multiple system atrophy (MSA) is a rare, rapidly progressing and fatal neurodegenerative disease of unknown etiology that is clinically characterized by a variable combination of parkinsonism, cerebellar impairment, and autonomic and motor dysfunction [1, 2]. Together with Parkinson disease (PD) and dementia with Lewy bodies (DLB), MSA belongs to the neurodegenerative group of α-synucleinopathies which are characterized by the deposition of aberrant α-synuclein (αS) in both glial cells and neurons. MSA is considered a synucleinopathy with specific glioneural degeneration involving striatonigral, olivopontocerebellar, autonomic, and peripheral nervous systems [3, 4]. The neuropathological hallmark of this unique proteinopathy is the deposition of aberrant fibrillary αS in glial cells, mainly oligodendroglia, forming glial cytoplasmic inclusions (GCI) , which may even represent a primary pathologic event [3, 6, 7]. Less frequent are neuronal cytoplasmic inclusions (NCI) and other cellular deposits. Inclusion pathology is accompanied by neuronal loss, widespread demyelination, and gliosis. Degeneration of multiple neuronal pathways over the course of the disease causes a multifaceted clinical picture of this multisystem disorder . The etiology and pathogenesis of MSA are not fully understood, but converging evidence suggests the propagation of misfolded αS from diseased neurons to oligodendroglia and its spreading from cell to cell in a “prion-like” manner [8, 9], inducing oxidative stress (OS), proteosomal and mitochondrial dysfunction, dysregulation of myelin lipids, decreased neurotrophic factor activity, neuroinflammation, and energy failure that result in a multisystem involvement [3, 4, 10–12]. Recent experimental and human studies demonstrated that deposition of αS and other pathologic proteins induces neuroinflammation not only in MSA but also in other neurodegenerative diseases, e.g., PD and Alzheimer disease (AD) [13–24]. In MSA, αS has been shown to mediate formation of abnormal inclusion bodies and to induce neuroinflammation, which, interestingly, may also favor the formation of intracellular αS aggregates as a consequence of cytokine release and the shift to a pro-inflammatory environment . αS may directly activate microglia, and recent studies have shown that only fibrillary αS is an important inducer of pro-inflammatory immune responses , associated with increased production of key pro-inflammatory cytokines, like tumor necrosis factor (TNF)-α and interleukin-1β (IL-1β) . The association of activated microglial cells and GCI burden  suggests that pathologic αS triggers inflammatory response in α-synucleinopathies by affecting αS aggregation and provoking cell death . This was corroborated by a number of experimental studies in vitro and in vivo [29–31]. These and other studies supported the notion that microglial activation may contribute to the progression of the neurodegenerative process in MSA and in other synucleinopathies via increased levels of reactive oxygen species (ROS) [20, 32, 33], like in other neurodegenerative diseases . Although this mechanism is non-specific, it may be exploited for therapeutic and neuroprotective interventions. Neuroinflammation characterized by microglial activation with secretion of many pro-inflammatory cytokines, in particular IL-1β and TNFα, has been implicated as main effector of the functional consequence of neurotoxicity, resulting in mitochondrial dysfunction , thereby contributing to the progress of neurodegeneration [13, 17, 44–47]. The two cytokines are potent mediators of microglial functions and modulate the complex networks of interactions of microglial-secreted molecules. The role of neuroinflammation has been demonstrated repeatedly in animal models of PD [21, 29, 48, 49] and of MSA [49–51]. The major pro-inflammatory cytokine released by activated microglia is TNFα secreted by the brain resident microglia/macrophages in response to various stimuli. 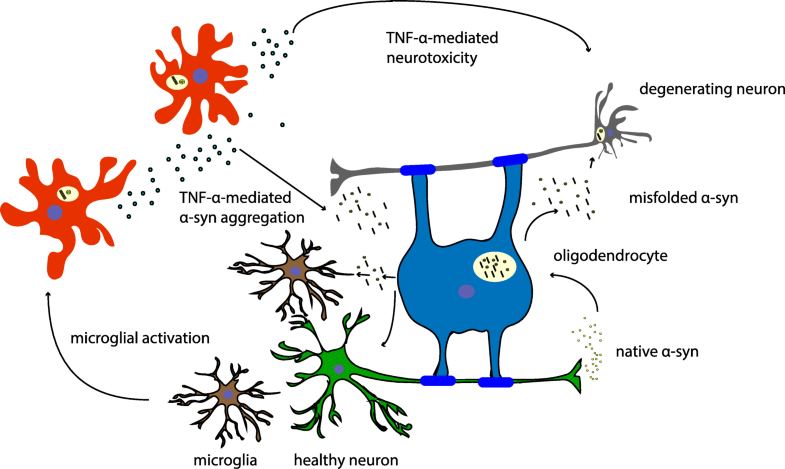 Microglial TNFα plays a major role in angiotensin-induced dopaminergic cell death. Microglial release of TNFα is mediated by activation of angiotensin type 1 receptors, NADPH (nicotinamide adenine dinucleotide phosphate)-oxidase, Rho-kinase, and NFK-β . An early increase in TNF, which leads to protein thiol oxidation resulting in activation of ASK1 (apoptosis signal-regulating kinase 1)-p38 signaling, may be critical for neuroprotection in PD . Increased levels of TNFα and IL-1β have been detected in the cerebrospinal fluid of PD patients ; in serum of patients with MSA ; in p t-mortem tissue of DLB, PD, and MSA [56, 57]; and in animal models of PD [45, 58–62]. It has been demonstrated to play a major role in neuroinflammation-related cell death in PD, AD, and other CNS disorders. Experimental studies indicated that TNFα is toxic for dopaminergic neurons in vivo  and in vitro . Long-term expression of TNFα seems to be necessary to exert univocal toxic effects in the substantia nigra (SN) . The increased frequency of TNF1031, a high producer allele of TNF, in Japanese MSA patients compared with controls  and increase of TNFα rs1799964 and IL-1β rs16944 polymorphisms in Chinese patients with MSA  suggest that they may represent genetic risk factors for MSA and that TNF may have a toxic effect in MSA. Interleukin-8, intercellular adhesion molecule-1, and TNFα polymorphisms significantly increased the risk of MSA . Due to the possible cyclic nature of αS aggregation/release and gliosis in MSA, interventions that target neuroinflammation may have the potency to slow the progression of the disease and increase the quality of life . Recent studies have approached α-synucleinopathies including MSA, by use of immunotherapy [74–76]. They have been shown to reduce αS co-localization in oligodendrocytes and astrocytes but increased microglial uptake, with decreasing demyelination, neuronal death, and motor deficit . Other studies aimed at microglia as therapeutic target, e.g., treatment of the PLP-αS mouse model with minocycline reduced the density of activated microglia and inducible nitric oxidase synthase and toll-like receptor 4 immunoreactivity . Recently, an inducer of heat shock proteins (HSP), carbenoxalone, was shown to decrease pro-inflammatory cytokines and OS in a rotenone model of PD . Other treatments targeting neuroinflammation in glia and immune cells may be promising therapeutic strategies for MSA . Inhibition of the biological effects of sTNFα by etanercept and infliximab displayed beneficial properties against rheumatoid arthritis and other peripheral inflammatory diseases. Unfortunately, these agents are large macromolecules that minimally pass the BBB and thus will preclude their utility in CNS neurodegenerative disorders. BMS-561392 reduces the amount of sTNFα by inhibiting TACE; however, clinical phase II trials for rheumatoid arthritis have been halted due to mild hepatotoxicity , which might be due to the accumulation of tmTNFα and TNFRII increase. This effect has been described in available anti-TNF treatment, but in this case, hepatic injury usually takes a self-limiting course. In addition, BMS-561392 has shown poor ability to penetrate the BBB and can therefore not be considered a suitable candidate substrate. In contrast, thalidomide analogs can readily and rapidly pass through the BBB and, if well tolerated in animal studies, may be of potential in a wide spectrum of CNS diseases. The mechanisms underlying thalidomide’s actions have been summarized by . In brief, the agent comprises two conjoined heterocyclic moieties—a phthalimide and a glutarimide ring showing structural modifications [86–89]. Recent studies confirmed that the actions of thiothalidomide agents were identical to that of thalidomide. They caused a concentration-dependent reduction in luciferase activity—consistent with the mechanism destabilizing the mRNA of TNFα , and thereby reduce TNFα synthesis. Thus, thalidomide and its analogs are excellent candidate agents for use in anti-TNFα therapies in a variety of diseases associated with neuroinflammation, particularly since they act at the levels of TNFα synthesis rather than for scavenge released protein or inhibit its interaction at a receptor level . Infusion of mesenchymal stem cells in a transgenic mouse model of MSA inducing a downregulation of cytokines involved in neuroinflammation suggested a potent effect on immunomodulation and neuroprotection . A recent study investigated the therapeutic efficacy of combining an unconventional anti-inflammatory therapy (lenalidomide, a small thalidomide derivative with immunomodulatory activity and therapeutic effects in multiple myeloma [91–93], with inhibition of TNFα production [93, 94]) with an αS-reducing immunotherapeutic approach (CD5-D5 single chain antibody) in a novel transgenic mouse model of MSA pathogenesis. The combined treatment achieved better results than each method alone; it reduced astro- and microgliosis, αS levels, and partially improved deficits in MBP (myelin basic protein)-αS transgenic mice. These effects were associated with an activation of the Akt signaling pathway, which may mediate cytoprotective effects downstream TNFα . Other recent studies demonstrated the neuroprotective and anti-inflammatory activities of allyl isothiocyanate (AITC), an aliphatic isothiocyanate derived from the precursor sinigrin present in vegetables of the Brassica family, on microglial cells through attenuation of JNK/NF-κB/TNFα signaling, which may have significance in neurodegeneration . Combined active humoral and cellular immunization approaches, which are capable of triggering neuroprotective responses of regulatory T cells (Tregs), support the further development of multifunctional (vaccine) approaches for the treatment of synucleinopathies . These results open the door for the design of more complex clinical trials in which a carefully planned combination of therapeutic approaches can complement each other to target multiple aspects of the pathobiology and pathogenesis of MSA and related neurodegenerative disorders.